Nearly 100 loci have been identified for pulmonary function, almost exclusively in studies of European ancestry populations. 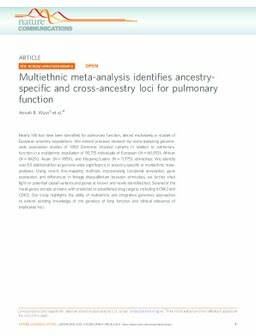 We extend previous research by meta-analyzing genome-wide association studies of 1000 Genomes imputed variants in relation to pulmonary function in a multiethnic population of 90,715 individuals of European (N = 60,552), African (N = 8429), Asian (N = 9959), and Hispanic/Latino (N = 11,775) ethnicities. We identify over 50 additional loci at genome-wide significance in ancestry-specific or multiethnic meta-analyses. Using recent fine-mapping methods incorporating functional annotation, gene expression, and differences in linkage disequilibrium between ethnicities, we further shed light on potential causal variants and genes at known and newly identified loci. Several of the novel genes encode proteins with predicted or established drug targets, including KCNK2 and CDK12. Our study highlights the utility of multiethnic and integrative genomics approaches to extend existing knowledge of the genetics of lung function and clinical relevance of implicated loci.